When its the middle of winter and you've got a full day of work ahead of you, the Hudson will fill you up and keep you warm. Country fried steak, hashbrowns and gravy with an egg on the go. Can't beat that. Always a friendly face behind the counter, great service! You guys are amazing. You give back to the community and your catering is fabulous! Love the deli, the pizza is delicious, and the ice cream is tasty! they have the best seafood salad in all of Union County. from their sandwich and salads to fry food and mochas everything tastes yummy! Great selection for breakfast and lunch. Always fast, friendly service! Great service and yummy deli foods! The Staff is always nice out there! My favorite place to stop on my way to work. Love being able to get healthy food choices. Great food and a wonderful staff. Great variety of items in the store. The best little store in town!! whatever your looking for, they got something to fit your needs. delicious food and a great selection of drinks. we love to stop in and grab some delicious ribs. I stop here often on my way to work in Cove. The food is great! My faves are the cinnamon rolls and biscuits and gravy! The ladies that work here are polite and friendly, especially with how busy it can be in the mornings. Love the biscuits and gravy and friendly service. they did the food for a thanksgiving get together we had and the turkey and sides was so amazing. and i love the friendly service. I love the cream filled logs! awesome sandwhiches and one of our must stops when in the area. Stop in now and then to grab goodies on our way out of town. Never disappointed. Best breakfast and friendly service. Love this little store! They are very friendly, great store , very clean , food is good . love the cream filled logs! Just like the ones I got as a child after swim team practice! So many choices, I Love having them so close to my work! Puts the convenience in convenience store. They have a great selection and awesome in-house foods. 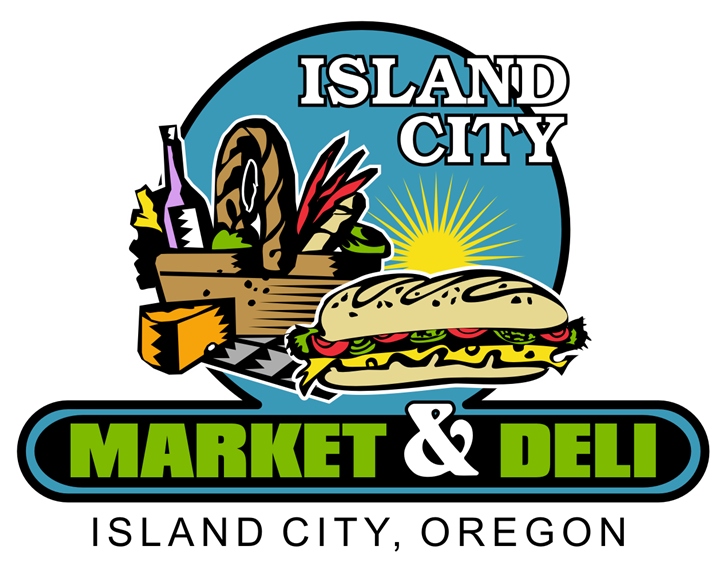 Love Island City Market & Deli they have the original cream filled logs every time my family comes from out of town they have to have one from no place else but here. They also have amazing deli food I love the chicken on a stick and jojo's. Their milkshakes and deli foods are delicious! you make the best box lunches. the chicken pasta salad is delicious! best breakfasts , love the chicken fried steak with hashbrowns and gravy! very friendly people and good breakfast food that I have almost every day and there Donut's are to die for. We usually stop here to get drinks before sporting events in La Grande... the customer service is what sticks out the most to me, all of the employees have always been very friendly! I love their coffees and they have the cheapest and biggest selection of torani syrups in town! Very friendly and they have the best pizza and ranch!! Great on the go or hang out and eat there! OR have them cater your event! Good food, good coffees, good people, goodness all the way around. Great service and great food! Especially the catered meals! Love this place!!! Great food awesome service and quick checkouts!! Can’t get any better!! Love your doughnuts best ever!! Friendly service and a great atmosphere with lots of variety!! Well done! love this place! great place to grab a coffee and the special logs are so yummy! Great place with lots of variety. Fast and friendly help also. I absolutely LOVE their cinnamon rolls! some of the best donughts around and their deli food is amazing. so nice, with yummy food. I love this little store. Everyone is always so nice! Their sandwiches and donuts are yummy! Great coffee too. I really recommend there milk shakes soo good, great store. great food. coffee and donuts. I recommend you stop and give them a try and dont forget they also cater !!! We go here when in island city, great food & terrific service ! We visit a lot. Always an amazingly friendly staff, and great sandwiches! Great selection. Good prices and service isn't bad. I don't go here enough but they have an amazing selection of torriani syrups. And really good chocolate milkshakes. I would definitely recommend this lovel y team to cater any event! The display was beautiful, service was prompt, and the food was well enjoyed by everyone! Amber and Kathleen were friendly, professional, helpful, and so easy to work with! Thank you so very much! We hold our annual After Christmas Party at The Urban Vine with Island City Market catering. The food, decor and service are always the best and we are always super happy and grateful for what they do! Kathleen always makes sure everything is wonderful! Always delicious and friendly people!! Let’s these guy do the cooking for you so you can enjoy the gathering! Excellent catering and hospitality! Wonderful food and a comfortable atmosphere. In a hurry? Need something quick to get cha on down the blacktop?Let me put you wise. They prolly got it.Don't like what's in sandwich case? They'll make you something to order.Chips, sweet tooth, couple cold ones? Yep!Drift on in, see what I mean. I am so happy to live ~1 mile down the road from these guys! Super friendly staff, AMAZING deli sandwiches, and giant super tasty pizzas. They're my first stop if I just need an onion, some fresh fruit, or homemade tortillas chips (yes, made fresh daily ). Friendly staff who have lots of yummy food and coffee to choose from, if you are driving through Eastern Oregon stop here for a donut, coffee or one of their many deli items !!! We often stop for a chicken on a stick, for travel down the road... Always excelent... Lots of snack food choices.